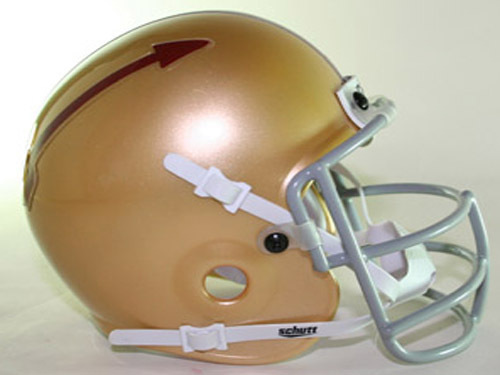 Florida State had three different helmets for the 1962 season. 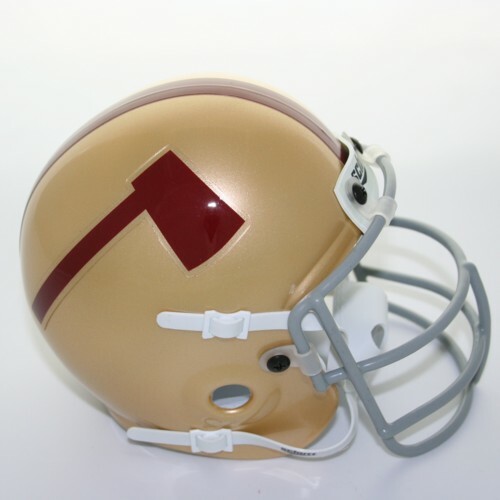 This week we take a look at the three helmets of the 1962 Florida State Seminoles. 1962 marked Bill Peterson's third year as top man for the Noles, and Tallahassee wasn't exactly hopping after his first two seasons. FSU was 7-11-2 going into '62, and Peterson's seat was probably feeling a little warm. Perhaps, to distract fans and the brass, Peterson divided his team into three squads: the Renegades (the defensive players), the War Path (the offensive players) and the Chiefs (two-way players). And, with fun, new names, Peterson couldn't resist spicing it up a little more by having three distinct helmets for the three squads. The Chiefs squad had the side profile of a Seminole on their helmets, albeit a crudely drawn Seminole. The Renegade squad had a tomahawk. Equipping the defense with actual tomahawks probably would've helped more, however. And, the War Party squad had a singular arrow. The first arrow to grace FSU's helmets, and, perhaps, the inspiriation for today's iconic helmet logo. Sadly, the fun names and the fancy helmets didn't help the Noles performance on the field, and FSU finished 4-3-3 in '62.